Obviously, the pairing of tomatoes and lettuce didn't originate with our local, sustainable farmers. Still, I've always considered it a challenge to see if I could push the limits and actually prepare a homegrown salad with our own heirloom tomatoes and lettuce. Last weekend, with an impending frost, I grabbed a large bowl, headed to the gardens, and harvested all of the decent looking tomatoes, peppers, and herbs before they succumbed to the weather. Peppers were sliced and frozen for winter fajitas, basil turned into pesto for a little taste of summer mid-winter, and the few ripe tomatoes were either eaten immediately or popped into freezer bags to use with pasta. But the pile of unripe, green tomatoes towered on the counter. So, it was time for a little science experiment. 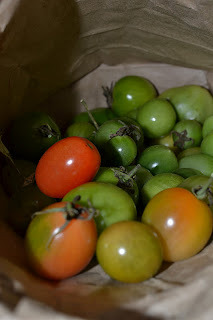 I've read various methods for ripening green tomatoes—put them in a box, hang the whole plant upside down in the garage. Instead, I opted for the easiest method that seemed most logical. Plus, all that I needed for said experiment was a paper bag. And a banana. Now, that's my kind of experiment! First, remove any leaves, stems, or dirt from the tomatoes. You don't want anything that can cause bruising. Only use fruit that is bug-free, at least three-fourths of its full size, and glossy green (or just beginning to ripen) for best results. ...keep out of direct light, and voila! The banana helps speed the ripening process, as it releases ethylene. All fruits release ethylene, so you could also add a semi-ripe tomato into the bag with the green tomatoes, but bananas produce the most ethylene and quicken the process. Isn't it amazing when something actually works? Sadly, I won't be slicing tomatoes to serve on our homegrown lettuce. Somehow, I'm way behind schedule planting our fall garden, and our little lettuce plants are lingering in the driveway, begging to be transplanted into their home. But first I have to clean up all of the blackish, frost murdered plants from the potager. And transplant strawberries. And get the beds ready for mulch. Maybe I'll start a few tomato plants for the greenhouse, and when the lettuce is ready in the spring, we might have a real, homegrown salad. With tomatoes off the vine. So, quick! Go rescue your green tomatoes before the frost hits. And perhaps, if you're better organized than I am, you can have a homegrown salad with Thanksgiving dinner.